The lemon tree in my parents garden yields an abundance of citrus fruit each year and is now over 50 years old. Like all Italian families, no garden is without a lemon tree but this is not just your average lemon tree. 30 years ago, papa` decided that a meyer lemon tree, which at the time was well established and already 20 years old was not good enough. The tree needed lisborn or genoa lemons growing on it, those typically used in Italian cooking. This tree has since been grafted with lisborn lemons, oranges and two varieties of mandarins...truly a citrus glory. The meyer varieties even though not papa`'s favourite, have never gone to waste and are used in mamma's cakes or turned into granita or lemonade. This year my father decided to make limoncello for the first time using the meyer lemons. This recipe is not ready to be shared as yet as it has been scribbled on a piece of paper by papa`- half in English, half in Italian and with little indication of exact quantities (all'occhio)...typically Italian! He told me that my cousins wife had shared a recipe for limoncello she had made, but he had misplaced it. This was his attempt at piecing together the recipe. I had to spend some time with him discussing the process and making my own notes. I managed to score a bottle though and the results are amazingly delicious. The base ingredients are grappa (made by my uncle), meyer lemons and sugar. 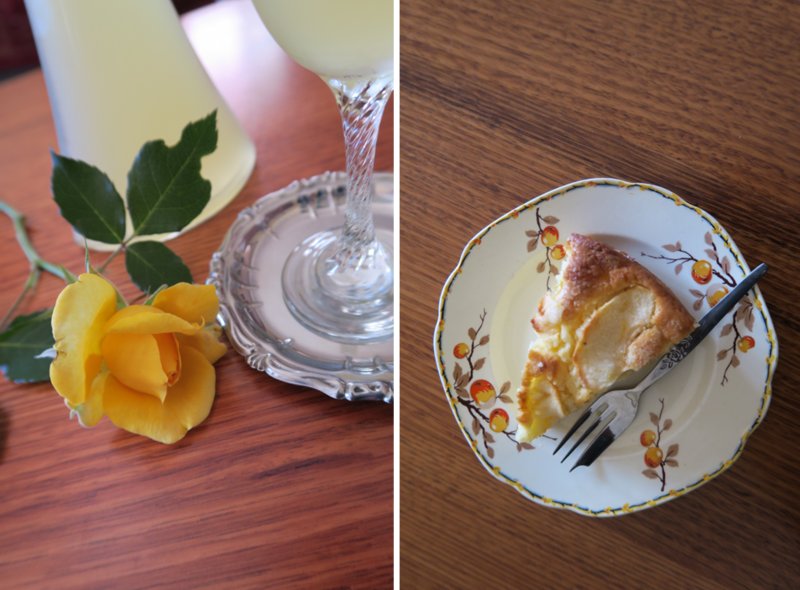 I will be sharing papa`'s limoncello recipe in another post with his other liqueurs, and hope my cousins recipe surfaces in the meantime. 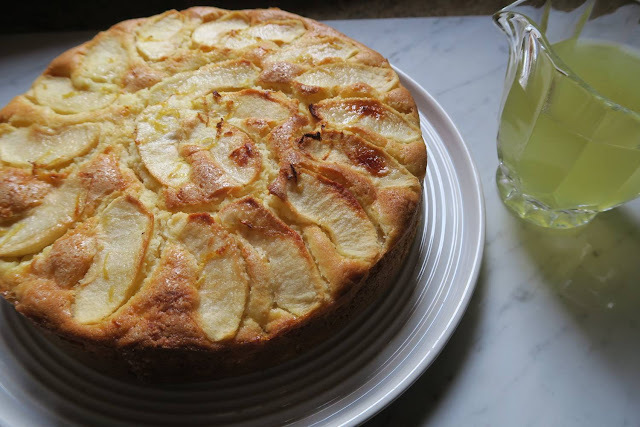 What I can share with you is mamma's apple cake, which instead of using lemon juice to drizzle over the apples so they don't turn brown, I have used papa`'s limoncello. 1 extra tablespoon of sugar to sprinkle on top of cake before baking. Pre heat oven at 180c and line a 20cm round tin with baking paper. Peel apples and slice thinly. 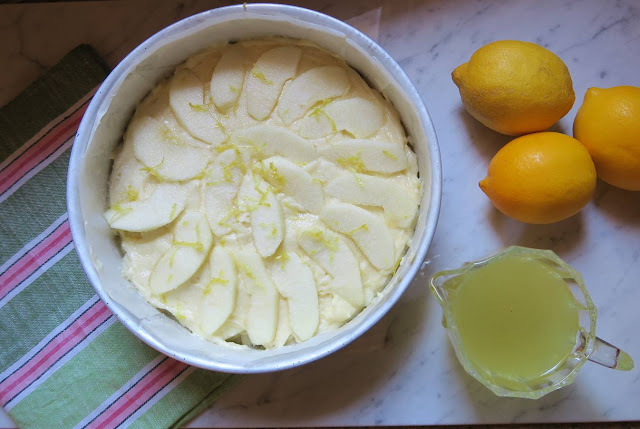 Place in a bowl and pour the limoncello over them. Stir through so they are all generously coated. Cream sugar and butter and then beat in the 2 eggs one at a time. Add 1/2 cup of milk a bit at a time alternating with the flour. Mix until well combined. If the mixture is too dry, add a bit more milk. Consistency of batter will depend on the size of the eggs. Pour 1/3 of mixture in tin and spread evenly with spatula. Drain apples and layer over mixture until covered. Spread more of the mixture on top, leaving 1/3 for the last layer and then ending with final layer of apples. Grate some lemon rind over final layer of apples and sprinkled with sugar. Bake in oven for 60 minutes. This recipe can be modified to suit your taste. Mamma would make it with cinnamon and stewed apples, a more traditional combination. Enjoy with a chilled glass of limoncello!